There was once a time that European otters were wiped out entirely in the Netherlands, driven to extinction from water pollution, traffic accidents, and human expansion into their freshwater habitat. Since 2002, when around 30 otters were reintroduced into the country, the species has been struggling to grow its population. After several worrisome months without a sighting of an otter in the town of Nieuwkoop, biologists there recently made a heartening discovery - one which suggests that the rare otters are not only still present, but that they seem to be having a good time, too. 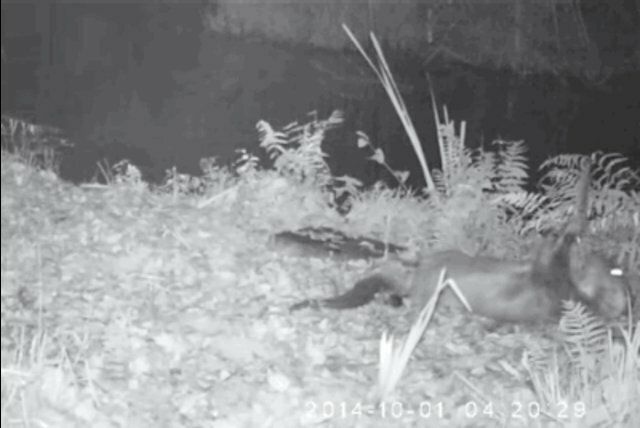 A wildlife cam captured footage of an otter appearing to be healthy and happy, spending several moments horsing around with a feather. Park ranger John Pietersen calls it "the most endearing side-show." "This movie is so very welcome! It is a confirmation that the ambassador of freshwater nature still lives in Nieuwkoop," says Pietersen (translated via Google Translate). "We started to worry because it had disappeared off the radar for several months." Although the original group of less than three dozen otters reintroduced to the Netherlands had increased its numbers to around 100 in just over a decade, many of the same threats which drove them to extinction in the first place continue to hamper their recovery.